Use Gnarly Whey 30 minutes before or immediately after workouts, as a nutrition boost before bed, or right after waking to help your body recover and maintain muscle properly. Mix into your favorite shake or smoothie or simply with water. 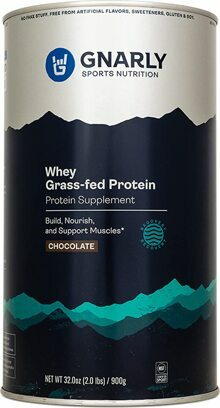 Whey Protein Concentrate (New Zealand Whey), Coconut Creamer, Trulicious® (Prebiotic IMO (Isomalto-Oligosaccharide), Erythritol, Stevia Leaf Extract (Rebaudioside A), Monk Fruit Extract), FOS (Fructo-oligosaccharide), Natural Flavors (Vanilla), Guar Gum, Xanthan Gum, Glucomannan, Citrus Bioflavonoid Complex. Gnarly Whey is exceptionally rich in highly bioavailable, essential amino acids. This allows your body to recover properly from a difficult workout, build more lean muscle mass and increase the energy available for your body. * We ensure our protein has come from grass-fed cows and is highly absorbable. * Our whey is free from growth hormones, antibiotics, hyper-immunizations and other chemicals. "THIS STUFF IS #@%$ AMAZING"
At Gnarly, we believe that natural nutrition doesn’t have to taste awful. Gnarly is dedicated to developing products that deliver in function and taste. Accomplishing this with natural ingredients is challenging, but we are committed to natural products that support your lifestyle while tasting and mixing better than any other brand out there. "I TAKE GNARLY BECAUSE BEING NATURAL IS A PRIORITY FOR THIS MAMA"
Gnarly only uses superior, natural ingredients, and you can feel and taste the difference. When using Gnarly products your avoid putting unneeded artificial colors, flavors and sweeteners into your body. Gnarly products are GMO-free and gluten-free. You can feel confident that Gnarly is clean and healthy. "I'M NOT A PROTEIN SHAKE FAN, BUT THIS STUFF IS AMAZEBALLS!"